Another old post transfered over. So how do you defeat a charge by the Rohirrim like what happens in the movie? Simple, line up your Trolls and Mumakils and watch the horses bounce off. You can then kill any Hobbits and cross-dressers at your leisure. This game played was based upon an old SPI game from the 70s. An almost direct conversion, but instead of counters we used minis on an hex based table top. The actual walls of the city actually looked quite neat being made from components of a block stacking game based upon the Leaning Tower of Pisa! We lost in the end, apparently even in the original game it was almost impossible for the bad guys to win. maybe it was because I spent to much effort in trying to kill off the main characters. Didn't think much of the map layout either, with no outer ramparts to the Pellenor, and hills scattered around the place. On thing I might of done is convinced then to do 'The Battle of Un-Numbered Tears' which appeared in a wargame mag over 10 (nearer 20!) years ago. An old post from my first attempt at a blog on MSN Spaces - stopped using it as was a bit too public with notification of posts sent to work colleagues. A right blast from the past last night as not only did I end up playing Britannia for the first time in nearly a decade but the Britannia man himself, Gareth, made an appearance later on. Told Gareth about the Sunday Board Games, but he's mostly busy that day. Also of note :- There's a new Edition of Britannia coming out late 2005\early 2006 by the original designer. The original versions of the games (two separate set of rules by Gibsons and Avalon Hill) had their rules messed around with by in-house people (who obviously knew better than the PhD holding designer!) so the new edition should be a little bit simpler\slicker. Another go at Pauls quick play WW2 tank game based upon Warhammers armour combat resolution. Once again set in the early North Africa theatre. A mini campaign but different from last time in that it used a non-symmetrical hex map rather than a symmetrical nodal one. Two forces venturing down a valley to try and capture their opponents villages\command posts. Movement was hidden but scouting neighbouring hexs with armoured cars and aircraft was allowed. Unless you were willing to play the encounter out the only things your scouts could see were clouds of dust. The allies held line deciding to wait for the Axis to advance. A minor skirmish occurred between scouts but after that it was a wait for a few turns until the first major clash occurred. As the units approached each other and the through the dust it soon becomes clear that the allies have the upper hand on the ground. The big fear of Mk III Panzers were unfounded. What we didn't take into account was the air support. 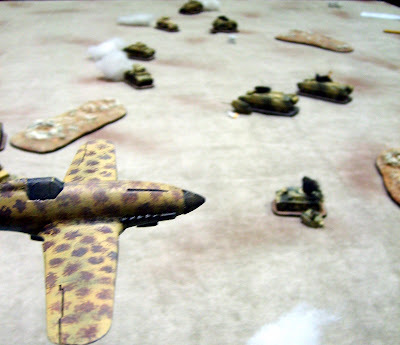 The Italian airforce prove to be decisive, the bomber taking out both main tanks. This completely swung the encounter to the Axis especially as the fighter returned for a second strafe damaging the remaining armoured car. After this the campaign came to a close. It turned out that the Axis force was the only one assaulting and the main rump was defending their command post. So It would of been possible for the Allies to stop it penertrating any closer to our own CP. Despite the recent loss the campaign was called as a draw. First Uncharted Seas battle for my almost completed Thaniras Elves. Verses Colin and some of Graeme's Orcs (Colin leaving his beloved Dwarfs at home.). Two other US games were also taking place. Slightly smaller than the recommended 4ft by 4ft table size with an Island in the middle of the playing area to split things up. At least the Elves had the weather-gauge in their favour at the start with the wind directly behind them. The massed squadron of six orc frigates was an awesome sight as the wall slowly advanced forward, devastating an elven frigate squadron with their linked forward fire. That was until they got frozen in place by the Elves magic and were encircled and picked off in place by the Cobra Cruisers. Did manage to get the cruisers and a couple of frigates behind the Orcs and out of their devastating forward fire zone, but the damage had already been done to the Elven Phoenix Battleship which ended up rammed and taken prize. The Orcs started to get frustrated with the Elves magic which they were not able to counter effectively. The carefully lined up shot against a cruiser by the Orc battleship went to waste as the ship was magically transposed out of shot. The Orcs did mange to have effective damage control as they repaired their Battleship from five damage down to one. This proved to be decisive as at the end of the game their was only the battleship and one elven frigate left on the table hiding behind the island. Even sailing into the wing the frigate is faster than the battleship so was able to escape eventually. Finally got my copy of Martians!!! off Phil. Contents very similar to Zombies!!! Don't think I need to punch and de-chad the tokens as can use my existing ones. As per usual with Twilight Creations one of the first things to do is check up online for FAQs and rules clarifications. Unlike previous games and expansion the rules weren't posted up on the TC site or BoardGameGeek in advance. Started the night with a game of Family Business. A full compliment of six players lead to a lot of shutting out of participants as interrupt cards sent the turns back across the table. It not for the fact that it's a fun game then this could really annoy people but it was taken in the right spirit. The game could do with some more cards in the deck as we managed to get through the deck at least twice, might even of been three times. 'St Valentine's Day' was used to good effect twice to wipe out a number of mobsters. True to life Dillinger had a couple of close escapes from the Hit List before becoming the final casualty of the game; leaving Jim with the sole surviving non-entity mobster and the win. This was followed by a couple of games of Munchkin, the original version with both 'Unnatural Axe' and 'Need for Steed' expansions. Both were over quite quickly as, with more people than normal playing, there seemed to be more assistance given. Managed to win the first game after a string of volunteers helped me kill a high treasure monster. I gave up the loot but got two levels to jump to ten and the win. Not so good in the second game, as a joint victory happened when an elf assisted a combat with both participants at level 9, soon to be 10. Munchkin Bites! one of the many alternate versions of the original game. Compatible with the original and the other expansions. A three player game everybody reaching level 9 prior to the winning kill. Despite the close finish I didn't enjoy playing it as much as the original. The card balance didn't seem right with a lot of cards being passed between players due to charity and one card in particular that effectively allowed hoarding if you passed the charity cards to the right person. Also the cartoons and puns on the cards just didn't seem as good. Elsewhere Jim was refereeing a game of Uncharted Seas with an home-brewed convoy scenario with his own scratch built dwarven ships to supplement Graeme's fleets. Was a large game and took up three tables with five players, 2 Dragon Lords, 3 Dwarfs. Details of the scenario are available on the Spartan Games Forum.